The About person will not see Tasks that are about him unless he is the Owner of the Task. The Admin can assign the user role ManageTasks to anyone that needs to be able to monitor and view all Tasks, regardless of whether or not the user is associated with them. This role would be good to assign to a pastor that is over several ministers or ministries, in order to easily keep up with Tasks that are incomplete. By setting these filters and leaving them, it’s so easy for a minister to access Tasks Search and then review the list during a weekly staff meeting. See below for the Actions you can perform on this page. This page has a number of ways to filter the list of Tasks. Select the appropriate Status from the drop down list. There will be up to 4 people involved in each Task. They are listed and identified below. About - This is the person about whom the Task was created, i.e. the person that will receive the contact or ministry touch. Owner - This is the person that created the Task or to whom the Task was transferred, if it has been transferred. Delegate - This is the person that has been assigned to complete the Task. Originator - This is the person that created the Task and will display only if the Task has been transferred to a new Owner. To search for any of these 4 people, begin typing the last name of the person. After you have entered 3 letters, a list will auto-populate below the field. Continue typing until you have narrowed the list, then scroll down and select the name you want. Exclude New Person - This will remove any New Person Data Entry Tasks from the list. Archived - Displays for users with Manage Tasks role. Archived Tasks will only be displayed if you check this box. Is Private - Displays for users with Manage Tasks role. Check this box is you want to see only Tasks that are protected by a user role. If a Task is protected by a role, the role will be listed under the Status. My Tasks Only - Displays for users with Manage Tasks role. Other users will only see their own Tasks. Show Notes - When this box is checked, the notes on the Task will display. Enter any part of the Name/Description of a Task, such as Hospital if you have Tasks named Please Visit Hospital. Enter any part of the Notes that might be in specific Tasks, such as prospect or new member to find Tasks with that text. Enter the number of days to look back from either today’s date or the date entered. This is looking at the date the Task was created. Select an end date or the current date will be used. Use this in conjunction with the Lookback days to filter for a date range. You can click the Filter icon beside any name in the list to filter for just that name in that role. In other words, if you click the icon beside the name of a person who is the Owner, the page will filter for that person’s Tasks where he is the Owner. When you click the icon, it will become a green X, which you can click to remove the filter. Each time you click to view Task Details, a completed Contact, or a people record that page will open in a new tab. To return to the Task Search page, just click the browser tab named Task Search. This page offers several actions regarding the Tasks you are viewing. Anyone with Access can perform these actions for his own Tasks…or for other Tasks, if he has the role Manage Tasks. 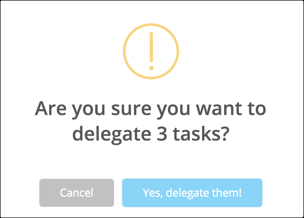 You can delegate multiple Tasks at the same time. Check the box to the left of each Task you want to delegate to the same person. Then select the drop down arrow beside the Search button and press Delegate Tasks . You will see a prompt letting you know how many Tasks you have selected. Press the button Yes, delegate them! . Or press Cancel if need to make a change. Search for the user to whom you want to delegate all of these Tasks. Click on the person’s name to complete delegating the Tasks. You can archive older Tasks so they will not display unless you specifically check the box to view them. Filter by a date and lookback days, to find those older Tasks to archive. 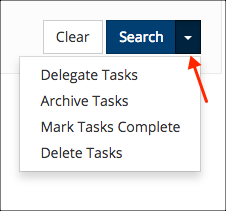 Check the box to the left of the Tasks you want to archive, and then select the drop down arrow beside the Search button and press Archive Tasks . You will see a prompt similar to the image above, showing how many Tasks you have selected and asking if you want to Archive those tasks. Press the button Yes, archive them! or press Cancel if you need to make a change. If you ever need to view archived Tasks, select the appropriate filters, check Archived and then press Search . If you have several Tasks that you have actually completed, but have not marked Completed, you can do that as a batch process. Check the box beside the Tasks you want to mark Completed and then select Mark Tasks Complete. You will see a prompt asking if you want to mark X number of Tasks Complete. Click Yes to complete the process. Check the box to the left of each Task you need to delete and then select the drop down arrow beside the Search button and press Delete Tasks . You will see a prompt similar to the image above, showing how many Tasks you have selected and asking if you want to Delete those tasks. Press the button Yes, delete them! or press Cancel if you need to make a change.